The first five boats were built together at McGruer's yard at Clynder and launched at the end of May 1929. 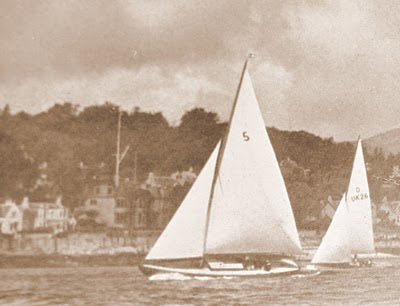 Sanda's first owners were W & T E Russell, who raced her successfully until the end of 1933, when they sold her to James Buchanan, member of the Royal Northern Yacht Club from 1929, of the Govancroft Pottery, Glasgow, who raced her up to the War. 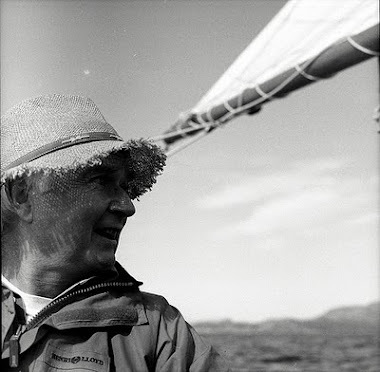 Mr Buchanan originally owned Iona, one of the newer Bute Slip boats, and one can speculate that he maybe felt the McGruer boats were faster. She is shown as registered to R K Sharp in 1951 (but why did Mr Sharp sell Bernera and then buy another Islander?). By 1977 she belonged to Mr and Mrs C P Kingston of Penarth. Now in Yorkshire with Huw Jones, who found her near Mallaig in 2009. For those who are interested her hull colour was originally dark blue.